When Zach Budish arrived for USA Hockey's junior evaluation camp in Lake Placid in the summer of 2009, he was nowhere near reaching his full ability and, not surprisingly, he wasn't a part of the team that won World Junior Championship gold in Saskatoon. But that camp represented his first major ice time since suffering a serious knee injury that ended his 2008-09 season before it even started. This time around, Budish is healthy and in top shape, and is aiming for a spot on the 2011 U.S. WJC squad that will defend its title in Buffalo this year. Budish, a two-sport star heading into his senior year at Edina (Minn.) High School, was injured playing football in October 2008. He tore the anterior cruciate ligament in his knee and surgery ended his hockey season after just 15 games. He didn't get back on the ice until March 2009, and didn't play a game until he arrived in Lake Placid. Zach Budish isn't the only Nashville Predators prospect trying to make the U.S. team for the 2011 World Junior Championship. Austin Watson, the team's 2010 first-round pick, also is competing for one of the 22 roster spots for the team that will try to defend last year's gold in Buffalo. Watson split last season between the Windsor Spitfires and Peterborough Petes, finishing with 20 goals and 54 points in 52 games. He played a third-line role with the Spitfires, but moved into a top-line role after a late-season trade to the Petes, and finished with 20 points in his last 10 games. He also gained a reputation for being one of the best defensive forwards in the Ontario Hockey League. 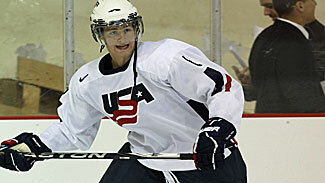 "What you're going to get from Austin, whether he's playing for Peterborough or playing for Team USA, is a strict, 100-percent effort, a competitive edge that can play both sides of the puck," Predators Assistant General Manager Paul Fenton told NHL.com. "They've put him in a defensive role, but I'm sure they're experimenting because they've got a good core of players there. He's very good defensively and very hard to play against. I think Austin, like Zach, has a very good chance to make the team because of the size, strength and hockey sense." "The last game I played was the first week of October, and then I didn't play a live-contact game until here, the beginning of August," Budish told NHL.com. "You can play shinny hockey and you can do drills, but it's always different when you get hit in the first live-action game." Rather than dwell on getting cut, Budish looked at last year's camp as a great way to get started on his freshman season at the University of Minnesota. A 6-foot-3, 223-pound forward, Budish had 7 goals and 17 points in 45 games, but his struggles matched that of his team, as the Golden Gophers finished 18-19-2 and in seventh place in the WCHA. "Our team struggled, we finished a game below .500, which isn't acceptable at Minnesota," Budish said. "We expect to make the (NCAA) tournament every year." While the team had its issues, Budish at least could appreciate the fact that his knee had healed to pre-injury form. "It didn't bother me at all this year at Minnesota," he said. "I played every game, didn't sit out any practices." He also said he didn't need to do anything special with his knee -- he iced it after games for the first month to prevent swelling, but after that never needed anything. The Nashville Predators, who selected Budish in the second round (No. 41) of the 2009 Entry Draft, also were pleased with what they saw. "Coming off the knee injury we were concerned going into his first year at college," Predators Assistant General Manager Paul Fenton told NHL.com. "Sometimes when you have major knee surgery it takes a while to recover, but he had a good freshman year and he's on a good path to being a pro." Those feelings were reinforced for Fenton when he saw Budish earlier this summer at the Predators' prospect camp. "We thought he did great," Fenton said. "Coming off that major knee injury, sometimes it takes a year for a guy to come back and he looks like he did before the knee injury. We think he's headed in the right direction." Budish said working out with his fellow prospects, as well as Predators players like Shea Weber, Colin Wilson and Wade Belak, was an eye-opening experience. "Away from the rink it's a 24-hour-a-day job," Budish said. "You have to treat your body well, recover before games and after games, before and after practices. You have to prepare yourself, and they just preach that all week. "It was nice to talk to those guys and get a feel for what it's like. When you're in there you have to always be learning, you have to take it in. Learn everything you can from those guys and the coaching staff." Another thing he's learning is a different position. Budish played right wing last season with the Gophers, but is a natural center, and played there during the USA Hockey camp. Budish feels he adjusted well to playing along the wall in college, and is comfortable playing in either spot. So is Fenton, who feels Budish is talented enough to play anywhere up front. "I wouldn't pigeonhole him," Fenton said. "We've had internal discussions about where he would play, but I think he could play both (center and wing). He has great hands to be able to make plays and dish pucks off the rush, and he's also got the ability to drop his shoulder and take it to the net. When he does shoot it, he shoots like a goal scorer -- he watches the puck go in, he places it in the right spots to make it difficult on a goalie. He's just got that ability in his eyes that tells me that if all goes well, he'll be able to score goals and make plays for us."